Like most other Asian cuisines, rice is the staple grain of Thai cuisine. According to Thai food expert McDang, rice is the first and most important part of any meal, and the words for rice and food are the same: khao. 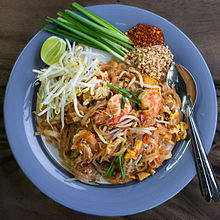 As in many other rice eating cultures, to say "eat rice" (in Thai "kin khao"; pronounced as "keen cow") means to eat food. 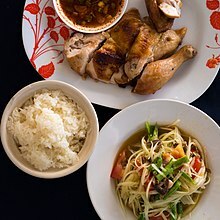 Rice is such an integral part of the diet that a common Thai greeting is "kin khao reu yang?" which literally translates as "Have you eaten rice yet?". [check quotation syntax] Thai farmers historically have cultivated tens of thousands of rice varieties. The traditional recipe for a rice dish could include as many as 30 varieties of rice. That number has been drastically reduced due to genetic modifications. ^ Tim Cheung (12 July 2017). "Your pick: World's 50 best foods". CNN. Retrieved 5 May 2018. 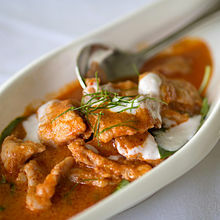 ^ "Royal Thai Cuisine". 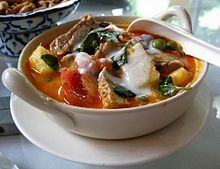 Thai Food Blog. Retrieved 29 October 2013. ^ Elsinburg, Andrea. "Have You Eaten Rice Yet?". San Diego Reader. Retrieved 22 September 2015. ^ "Nampu". Lanna Food. Northern Thai Information Center, Chiang Mai University Library. Retrieved 3 November 2014. ^ "Phrik lap". Lanna Food. Northern Thai Information Center, Chiang Mai University Library. Retrieved 3 November 2014. ^ Leela (4 June 2012). "Fruit Dips, Thai Style". SheSimmers. Retrieved 5 May 2018. ^ Fernquest, Jon (4 May 2016). "Pesticides in fruits & vegetables: Govt quality mark fails test". Bangkok Post. Retrieved 7 October 2016. ^ Frederickson, Terry (19 August 2014). "Q-mark: not a guarantee of food safety". Bangkok Post. Retrieved 7 October 2016. ^ "Thailand's Portuguese Cakes". Strangertalk. 4 June 2017. Retrieved 28 April 2018. ^ a b c Charoenpo, Anucha (6 January 2014). "Ancient ice-cream still worth a lick". Bangkok Post. Retrieved 7 October 2016. ^ Johnson, Richard (24 February 2012). "The world's best street food". The Guardian. Retrieved 4 May 2018. ^ Sula, Mike (21 July 2011). "The principal of Thai cookery". Chicago Reader. Retrieved 5 May 2018. 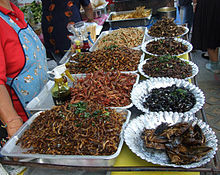 ^ "Thailand's gastro-diplomacy". The Economist. 21 February 2002. Retrieved 16 August 2018. ^ "Developing Chefs for Thai Cuisine Who Will Promote Thai Food Standards Overseas". The Government Public Relations Department (PRD) (Thailand). 21 March 2011. Archived from the original (Press release) on 26 September 2013. Retrieved 16 August 2018. ^ a b Karp, Myles (29 March 2018). "The Surprising Reason that There Are So Many Thai Restaurants in America". Vice. Retrieved 16 August 2018. ^ Adamczyk, Alicia (30 September 2014). "New York's Michelin-Starred Restaurants Announced For 2015". Forbes. Retrieved 6 October 2014. ^ a b c d e f Sukphisit, Suthon (13 January 2019). "Taking 'Thai' out of Thai food". Bangkok Post (Lifestyle). Retrieved 15 January 2019. ^ a b c Fuller, Thomas (28 September 2014). "You Call This Thai Food? The Robotic Taster Will Be the Judge". New York Times. Retrieved 8 September 2016. ^ "National Food Institute, the Ministry of Industry Organized Gala Dinner 'Authentic Thai Food for the World' to Upgrade 'Rod Thai Tae' [True Thai Taste] Food Standard Worldwide". Postup News. 25 August 2016. Retrieved 8 September 2016. ^ Charoensuthipan, Penchan (1 February 2019). "As FDA stumbles, laws to control salt in diet sought". Bangkok Post. Retrieved 1 February 2019. 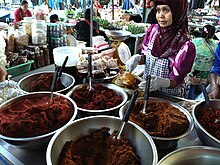 ^ "Salt Reduction in Thailand". World Health Organization Thailand. November 2017. Retrieved 1 February 2019.